It's February 24, 2009, Mardi Gras. No work. No school. I awaken early, dress in the dark, grab my gear and dash out of the house headed for the lake - careful not to wake my sleeping husband and children. I thrilled to learn that it's 37° outside. If I'm right, the water in Lake Martin is warmer than the air and a nice steamy mist will be rising from the surface. As I drive away, the sun is just appearing over the horizon. It's burning bright on the winter morning. I've never driven to the lake in the early morning, so I am excited at the prospect of what I will find. I arrive at the lake and out of my side window I immediately notice a blue heron standing still as a statue in the water, waiting for breakfast to swim into view. Then, I notice the mist. Just has I suspected, its dreamy tendrils are rising from the lake. I am giddy with anticipation. Within minutes, the golden sun breaks through the trees and beams of light streak across the lake, illuminating the mist. From where I am standing, a tree-lined peninsula separates the lake so that the water on the other side of it glows like an ethereal cauldron. I carefully compose my photos and fire away, knowing that something wonderful awaits on my memory card. The air is soon filled with the noises of lake activities. The cries of birds beginning their day. The rumbling of boat engines starting up and racing off to find that perfect fishing spot. I continue to shoot on foot, then I return to my car and tour the lake road, enjoying the morning as it unfolds. 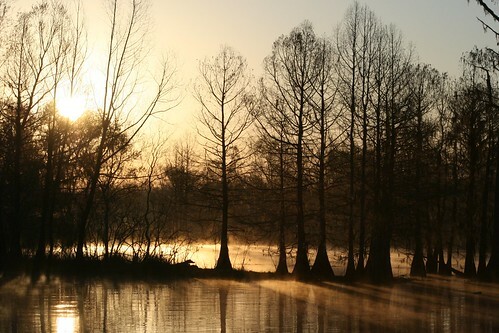 I have witnessed the birth of another beautiful day in South Louisiana. Great capture. It's great that you got to spend time doing what you love on this day.